Ibuprofen (IBF) is a 2-arylpropionic acid derivative, i.e., (RS-2-[4-isobutylphenyl]propionic acid). It was first introduced in 1969 in the UK and afterward marketed worldwide as a prescription medication only and now probably ranks after aspirin and paracetamol in nonprescription over-the-counter drugs. Thus, the drug has a better tolerability as compared to other nonsteroidal anti-inflammatory drugs. IBF is a nonselective reversible inhibitor of the cyclooxygenase (COX) isozymes COX-1 and COX-2, which are responsible for the conversion of arachidonic acid into prostaglandins including thromboxane and prostacyclin. Since prostaglandins play a key role in pyrexia, inflammation, and pain sensation, both analgesic and antipyretic potentials of IBF are attributed to the inhibition of prostaglandins. Thus, IBF is one of the most active compounds used as an antipyretic and analgesic in acute as well as chronic pain in osteoarthritis, dysmenorrhea, rheumatoid arthritis, migraine, postoperative pain, and dental pain and also has vasoconstriction action due to constriction of coronary arteries and some blood vessels because of inhibition of vasodilating prostacyclin produced by COX-2. Owing to its poor aqueous solubility (<1 mg/ml), the rate of dissolution of IBF from the solid dosage forms currently available is limited which leads to poor bioavailability that ultimately results in various unwanted effects. The major side effects include gastritis, dyspepsia, epigastric pain, heartburn, and peptic ulcer-gastrointestinal hemorrhage, which are dependent on the dose. By improving the solubility and dissolution rate of the drug, bioavailability and therapeutic importance of drug can be enhanced. Moreover, IBF has been declared as core medicine by the World Health Organization's in the “essential drug list,” indicating its medical need for a basic health-care system [Figure 1]. Solubility is one of the major challenges for pharmaceutical industries to acquire desired drug concentration in systemic circulations for effective pharmacological results since more than 40% newly developed chemical entities are practically insoluble in water. The process of solubilization takes place in three steps: first, the separation of the molecule of solvent which provides the space for solute molecules, second, breaking of ionic bonds in the solute, and finally, interaction between solute and solvent molecules to form a solution. There are several traditional and novel approaches to increase the solubility and thus bioavailability of the drug such as modification of the crystal habit, particle size reduction, cryogenic techniques, drug dispersion in carriers, complexation, supercritical fluid process, change in pH, use of buffer, co-solvency, polymeric alterations, and use of surfactant and hydrotrope., Out of these methods, one of the popular approaches is to prepare solid dispersions (SDs) to enhance the oral bioavailability of poorly water-soluble drugs. This pharmaceutical technique of SD presented by Sekiguchi and Obi (early 1960s) investigated sulfonamide drug's eutectic melts for their dissolution performance using water-soluble carrier. This investigation found an improvement in the dissolution, absorption, as well as therapeutic efficacy of drug from the dosage form. Milk is highly nutritious drink with rich content of nutritious elements and a large number of peptides which are biologically active. Milk-made formulations are beneficial for ionized as well as unionized hydrophobic drug delivery by providing a simple, novel, and patient-friendly approach. Furthermore, the incorporation of milk in the formulation results in solubilization of drugs with improved pharmacokinetic properties along with taste masking and gastroprotective properties making it a promising carrier for drugs. The preparation of SD with milk is one of the best approaches for modulating aqueous solubility as well as gastric irritation of drug without any noticeable side effect because of its surface-active action and presence of amino acids. Based on all these considerations, the purpose of this project was to investigate the benefit of milk as dispersion carrier to enhance solubility and dissolution rate of IBF and consequently its bioavailability. IBF was received from the IOLS Chemical and Pharmaceutical Limited, Ludhiana, Punjab, India. Milk (yellow and green) were purchased from Verka milk plant, Hoshiarpur (Punjab), India. All the reagents and chemicals utilized in this study were of analytical grade. Capillary method was used to determine melting point. This method involves filling of drug into capillary tube sealed at one end at a height of 3 mm from the closed end. The melting point was determined digitally using drug-filled capillary and digital melting point apparatus. IBF 100 mg was weighed and dissolved into few milliliters of pH 7.2 phosphate buffer and finally made up the volume in 100 ml volumetric flask. From this stock solution, further concentrations were made. The samples were scanned using double-beam ultraviolet (UV)–visible spectrophotometer between 200 nm and 400 nm. The λmax was selected as the analytical wavelength of IBF in particular media. One liter (1000 ml) of yellow milk (YM) and green milk (GM) each was dried in rotary evaporator at 35°C and 100 rpm under vacuum. The powdered milk obtained was then dried in an oven (100 ml of YM yielded approximately 12 g while that of GM yielded 22 g/100 ml); passed through sieve no. #80 and stored separately in desiccator for further use. Solubility studies of pure IBF and SDs were carried out in different media, i.e., distilled water and phosphate buffer pH 7.2. Pure drug (PD) and each SD equivalent to 100 mg of IBF were taken in 15-ml screw-cap test tubes containing 10 ml of media. The solutions were shaken well and kept aside for 24 h with continuous stirring at a temperature of 25°C ± 0.5°C for enhancing the maximum solubilization of the drug in each solvent at room temperature by achieving equilibrium. After 24 h, the sample solutions were filtered through Whatman filter no. 1. One milliliter of filtrate was taken and diluted to a suitable concentration with respective media. The absorbance of the prepared dilutions was measured at 222.8 nm using UV–visible spectrophotometer. The physical mixtures (PMs) were formulated by triturating IBF with YM powder (YMP) and GM powder (GMP) in different ratios 1:1, 1:2, and 1:3 in mortar and pestle for 10 min, after that the samples were passed through sieve no. 80 and finally kept in desiccator till further use. The YMP, GMP, and mixtures of drug with YMP and GMP (1:1 ratio) were sealed in separately closed glass vials and exposed to conditions of 25°C and 70% RH for a period of 1 month. The initial color and appearance of samples were periodically observed on days 1, 3, 5, 7, 14, 21, and 30. The in vitro dissolution study was done in USP II dissolution rate test apparatus (paddle type) using phosphate buffer (900 ml) pH 7.2 at 37°C ± 0.5°C and 50 rpm. Amount of SDs and PMs each equivalent to 100 mg were weighed and kept in the dissolution vessel. Samples were taken at predetermined time interval at 0, 5, 10, 15, 20, 25, 30, 40, 50, and 60 min, and the withdrawn samples were suitably diluted with the same buffer, and at scanned wavelength of 222.8 nm, the absorbance of the samples was determined. The study was performed in triplicate. Based on the observations, the best formulation from each batch was selected and subjected to further characterization techniques. SDs and PMs were analyzed for drug carrier interactions based on the Fourier transform infrared (FTIR) spectra obtained using PerkinElmer FTIR spectrometer. The spectra in absorbance mode were obtained (spectral region: 500–4000 cm −1; resolution: 4 cm -1). X-ray diffraction (XRD) studies were brought about in the SD systems to determine the physical state of the drug using X'Pert PRO instrument. A Cu Kα source fitted with a nickel filter generates the radiation (wavelengths: 0.154 nm at 40 mA and 45 kV). Samples were scanned for 2 θ values over a range from 5° to 45° and at a scan rate of 10°C/min. The thermal behavior of IBF, milk powders (YMP and GMP), prepared SDs and PMs were analyzed using diamond differential scanning calorimetry (DSC) (Perkin, USA). Accurately weighed samples were hermetically sealed in an aluminum crucible. The system was purged with nitrogen gas at a flow rate of 60 ml/min. Heating was done from 30°C to 200°C at a rate of 10°C/min to obtain the required thermograms. The scanning electron microscopy (SEM) analysis of SDs was brought about using scanning electron microscope (JSM 6390, JEOl, Peabody, MA, USA) with 10-kV accelerating voltage. The samples were mounted on a double-faced adhesive tape and sputtered with thin gold palladium layer using sputter coater unit, and the surface topography was analyzed with a SEM. The melting point of IBF was found to be in a range of 76°C–80°C which was in compliance with the reported value. The scanned wavelength (λmax) of IBF was observed to be 222.8 which was in accordance with the reported value. Solubility of PD was determined at 25°C ± 0.5°C, in distilled water and phosphate buffer having pH 7.2 as shown in [Figure 2] and [Figure 3], respectively. 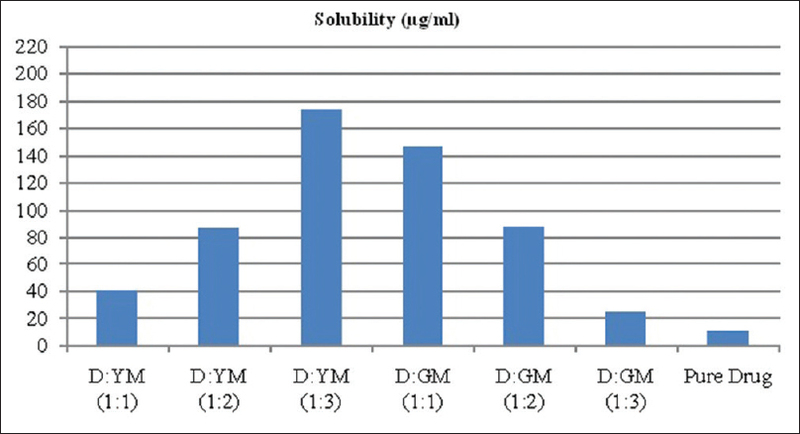 The solubility profile indicated a gradual decline in solubility when the drug was formulated into SD with GMP as compared to YMP. Moreover, drug was having maximum aqueous solubility in drug: YM (D: YM) 1:3 ratio, i.e., 174.038 μg/ml while in case of drug: GM (D: GM) maximum solubility was observed in 1:1 ratio. Similar kinds of results were obtained with phosphate buffer pH 7.2 [Table 1]. The improved aqueous solubility of drug observed with SD (especially D: YM in ratio 1:3) was because of particle size reduction and appearance of an amorphous state. The YMP was having relatively more content of protein per unit fat content of GMP. The aqueous solubility enhancement can be attributed to the presence of amino acids and surface-active agent content that entrapped the hydrophobic drug in the hydrophilic casein micelles. The drug-excipient study results did not show any significant change in color, odor, or the physical state of the mixtures as well as the individual components. The observations indicated that there were no detectable physical changes after 1-month study. PM of IBF with YM was evaluated for in vitro drug release in different ratios such as 1:1, 1:2, and 1:3. The maximum percentage of drug release from the PMs prepared using YMP was found to be 46.353, 47.592, and 57.424, respectively, after 10 min, while in case of PMs with GMP, the percentage of drug release was observed to be 43.257, 40.247, and 38.745 as shown in [Figure 4]. Hence, the PM prepared with YMP in 1:3 ratio was showing maximum drug release of 57.42% in 10 min. 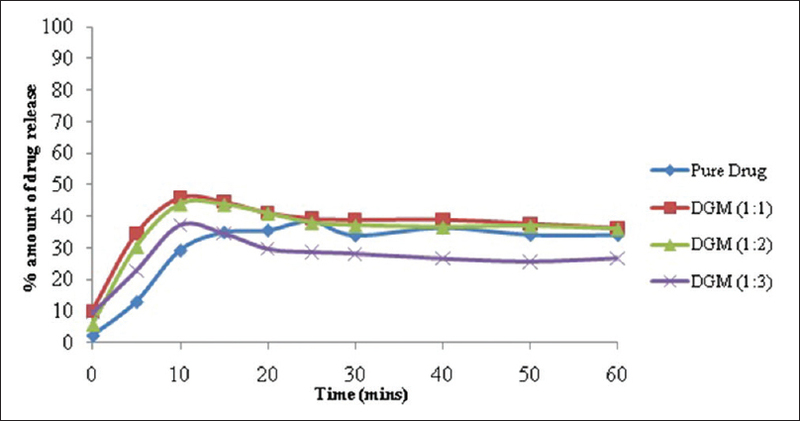 The SDs prepared with YMP using hot air oven showed a maximum percentage of drug release of 80.19, 85.509, and 98.539 in 20 min for 1:1, 1:2, and 1:3 ratios, respectively. The SDs prepared with GMP in the same ratios produced a maximum percentage of drug release of 37.056, 45.953, and 43.857 in 10 min, respectively. The results clearly indicated that the YMP, owing to the presence of relatively more amount of casein, entrapped the hydrophobic drug by forming micelles. The porous structure of micelles enabled the release of entrapped drug molecules from the inclusion complex in the dissolution media at a much faster rate. Moreover, the SD mixtures displayed higher dissolution rate as compared to PM because of metastable states of the components with higher energy. Further, the dissolution of the drug increases in the presence of carrier by preventing the aggregation of fine drug particles. The wetting property also affected dissolution rate significantly., After reaching to maximum, the dissolution rate started coming down which can be attributed to probable saturation of drug carrier. A comparison of dissolution profiles of SDs prepared with YMP versus PD and SDs prepared with GMP versus PD is shown in [Figure 5] and [Figure 6], respectively. The best formulation from each batch (based on percentage of drug release), namely PM with GMP and YMP (ratio 1:1 and 1:3, respectively) and SD with GMP and YMP (ratio 1:2 and 1:3, respectively) along with PD and GMP was subjected to FTIR studies. The obtained spectrum of IBF showed no significant changes on making PMs as well as SDs. SD and PM displayed all the characteristics of absorption bands of drug, GMP, and YMP indicating the absence of any well-defined interactions between them. 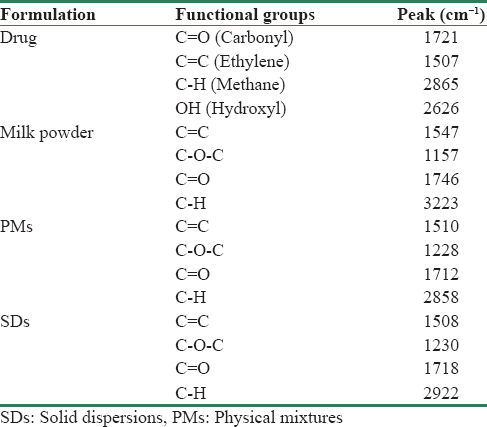 The characteristic bands of drugs and polymers are given in [Table 2] and [Figure 7]. 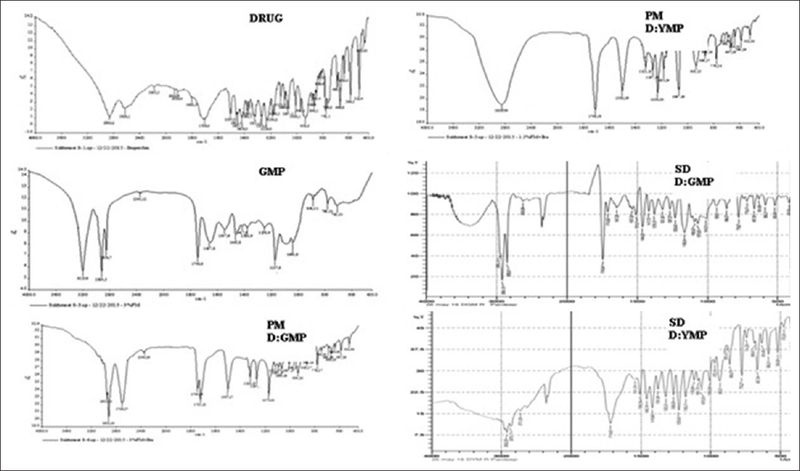 It was observed that incorporation of drug into GM or YM did not affect the position of functional groups in the absorption spectra of SD and PM. The absence of some characteristic peaks of functional groups in drug in case of SD may be due to incorporation of IBF into micellar structures. To confirm the purity of drug and conversion of crystalline drug into amorphous state, DSC of IBF and selected formulations was performed the melting endotherms of which are shown in [Figure 8]. DSC of PD showed sharp melting endothermic peak (Tm) at 79.63°C. YMP showed endothermic peak at 175.99°C, whereas GMP showed endothermic peak at 191.50°C. After the formulation of SDs, peak of drug reduced which confirmed the formation of amorphous form of drug from crystalline form. 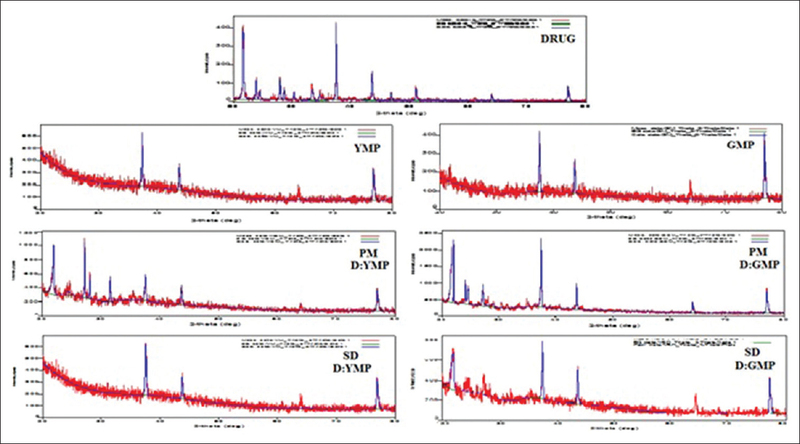 The SDs prepared by YMP itself using rotary evaporator reduced the peak of drug to great extent which indicated that YMP was more effective carrier for this conversion. The XRD pattern of PD, SDs, and PMs is shown in [Figure 9]. The intense peaks of crystallinity have been shown by XRD pattern of PD and MP (green as well as yellow) exhibited distinct patterns with diffraction peak. The XRD pattern of IBF shows sharp characteristic peaks at 11.5°, 26.8°, and 32°, while milk shows characteristic peaks at 78° and 36.7°. 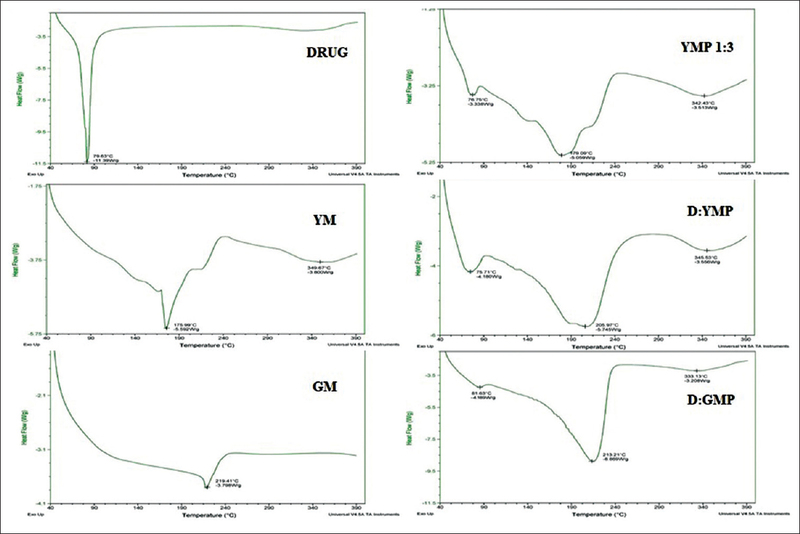 PM of drug with GMP reduced the crystallinity of drug to a large extent as compared to the YMP, while the SD of drug with YMP was able to reduce the crystallinity of drug to large extent as compared to GMP. Moreover, SDs prepared with rotary evaporation show great decline in crystallinity of drug with YM prepared by rotary evaporator. In SD, reduction of drug crystallinity was observed due to decreased intensity of characteristic drug peaks and some peaks got suppressed, thus indicating and its conversion to amorphous state. In the present work, dissolution rate of poorly water-soluble drug (IBF) was enhanced using milk as a natural carrier to improve the oral bioavailability. SDs and PMs were prepared and further characterized using FTIR spectroscopy, DSC, XRD, in vitro drug release studies, and SEM. The in vitro drug release for PD was found to be 38.243% only in 25 min, whereas for PMs with YM and GM, it was 57.42% (1:3 ratio) and 43.25% (1:1 ratio), respectively. SD prepared with YM in ratio 1:3 showed best results with a maximum drug release up to approximately 99% (1:3 ratio), and with that of GM, it was around 46% only (1:1 ratio). YM owing to better protein: fat ratio than GMP produced more convincing results. The successful improvement in the dissolution rate of IBF using milk as a generally recommended as safe carrier opens a wide scope of study of the delivery system with respect to improved patient compliance. Furthermore, the use of lactose-free milk for these formulations is still to be explored for patients with lactose intolerance. Thus, these advanced milk formulations have opened a new hope of using milk as a natural dispersing agent and a broad-spectrum drug carrier for a variety of drugs. Further studies are in progress to evaluate the anti-inflammatory potential of the prepared formulations in vivo. Rainsford KD. Ibuprofen: Pharmacology, efficacy and safety. Inflammopharmacology 2009;17:275-342. Irvine J, Afrose A, Islam N. Formulation and delivery strategies of ibuprofen: Challenges and opportunities. Drug Dev Ind Pharm 2018;44:173-83. Rashid A, White ET, Howes T, Litster JD, Marziano I. Effect of solvent composition and temperature on the solubility of ibuprofen in aqueous ethanol. J Chem Eng Data 2014;59:2699-703. Kumar S, Parkash C, Kumar P, Singh SK. Application of some novel techniques for solubility enhancement of mefenamic acid, a poorly water soluble drug. Int J Pharm Sci Drug Res 2009;1:164-71. Vemula VR, Lagishetty V, Lingala S. Solubility enhancement techniques. Int J Pharm Sci Rev Res 2010;5:41-51. Godse SZ, Patil MS, Kothavade SM, Saudagar RB. Techniques for solubility enhancement of hydrophobic drugs: A review. J Adv Pharm Edu Res 2013;3:403-14. 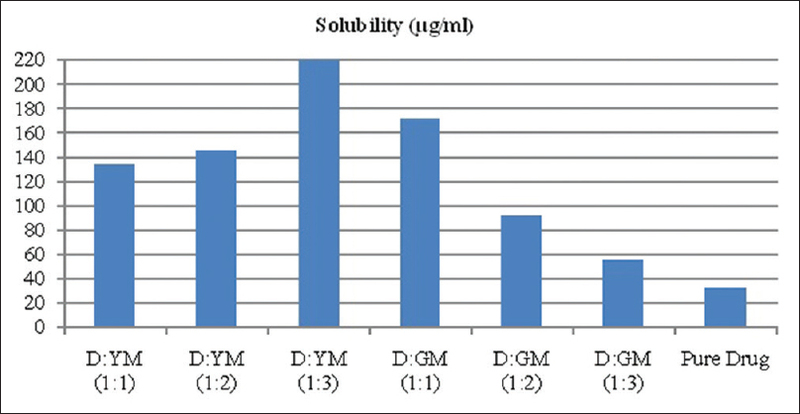 Kumar P, Singh C. A study on solubility enhancement methods for poorly water soluble drugs. Am J Pharm Sci 2013;1:67-73. Singh S, Baghel RS, Yadav L. A review on solid dispersion. Int J Pharm Life Sci 2011;2:1078-95. Kamal SS, Kaur D, Singh S, Sharma A, Katual MK, Garg AK, et al. An investigative and explanatory review on use of milk as a broad-spectrum drug carrier for improvement of bioavailability and patient compliance. J Young Pharm 2016;8:72-5.
van de Waterbeemd H. The fundamental variables of the Biopharmaceutics classification system (BCS): A commentary. Eur J Pharm Sci 1998;7:1-3. 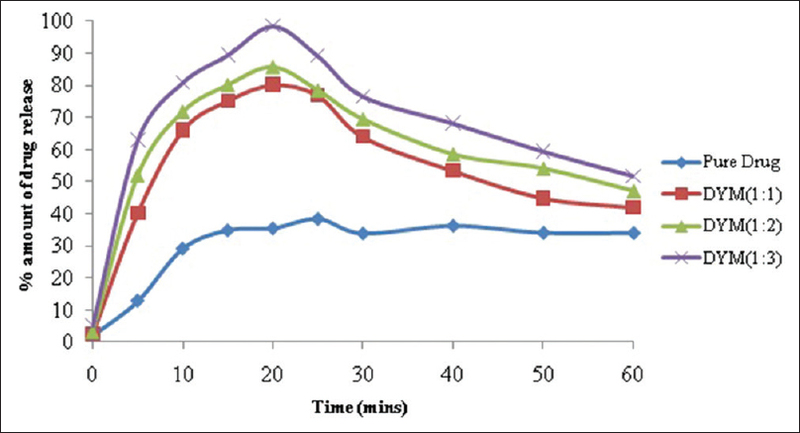 Masum AA, Sharmin F, Islam SM, Reza S. Enhancement of solubility and dissolution characteristics of ibuprofen by solid dispersion technique. J Pharm Sci. 2012;11:1-6. Kamal SS, Singh S, Kaur D, Sharma A, Katual MK, Kumar R, et al. Development and validation of UV-spectrophotometric method for estimation of ibuprofen in bulk and marketed tablets. Am J Pharm Tech Res 2015;6:198-203. Vijaya Kumar SG, Mishra DN. Preparation and evaluation of solid dispersion of meloxicam with skimmed milk. Yakugaku Zasshi 2006;126:93-7. Patidar K, Soni M, Sharma KD, Jain KS. Solid dispersion: Approaches, technology involved, unmet need and challenges. Drug Inven Today 2010;2:349-57. Bugay DE. Characterization of the solid-state: Spectroscopic techniques. Adv Drug Deliv Rev 2001;48:43-65. Sachan NK, Pushkar S, Sachan AK, Ghosh SK. Thermal stability and drug-excipient compatibility studies of peppermint and caraway oils for formulation of chewable tablets. Asian J Chem 2013;25:5930-4. Sharma A, Jain CP. 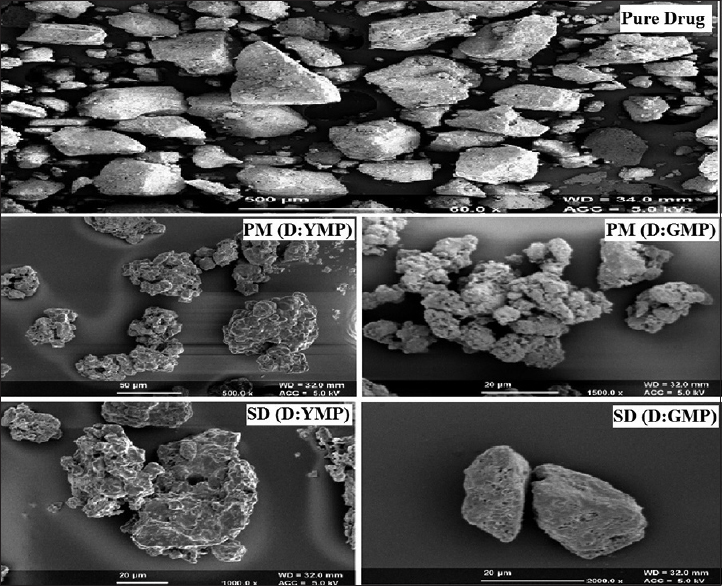 Preparation and characterization of solid dispersions of carvedilol with PVP K30. Res Pharm Sci 2010;5:49-56. Hancock BC, Zografi G. Characteristics and significance of the amorphous state in pharmaceutical systems. J Pharm Sci 1997;86:1-2. Debnath S, Kumar GV, Satyanarayana SV. Preparation and Evaluation of solid dispersion of terbinafine hydrochloride. Asian J Pharm Tech 2013;3:9-15. Hu L, Gu D, Hu Q, Shi Y, Gao N. Investigation of solid dispersion of atorvastatin calcium in polyethylene glycol 6000 and polyvinylpyrrolidone. Trop J Pharm Res 2014;13:835-42. Arun G, Shweta P, Upendra KJ. Formulation and evaluation of ternary solid dispersion of curcumin. Int J Pharm Pharm Sci 2012;4:360-5. Pawar AP, Paradkar AR, Kadam SS, Mahadik KR. Crystallo-co-agglomeration: A novel technique to obtain ibuprofen-paracetamol agglomerates. AAPS PharmSciTech 2004;5:e44. Vasanthan M, Narayanasamy D. Development of fast dissolving tablets of nisoldipine by solid dispersion technology using poloxamer 407 and poloxamer 188. J Young Pharm 2016;8:341-9. Available from: https://www.drugbank.ca/drugs/DB01050. [Last retrieved on 2017 Aug 25]. 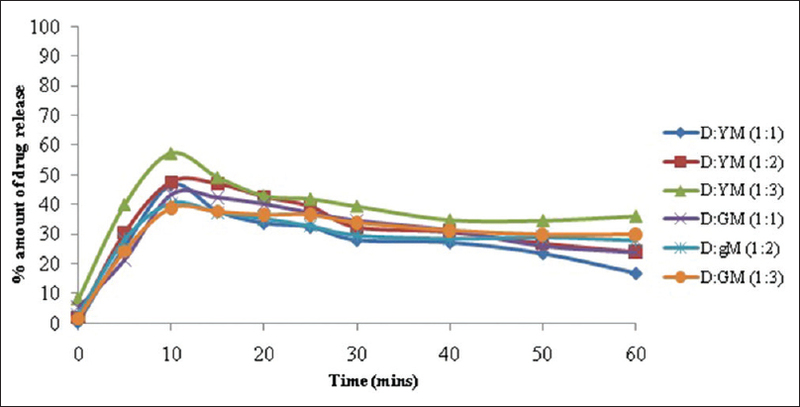 Choudhary A, Rana AC, Aggarwal G, Kumar V, Zakir F. Development and characterization of an atorvastatin solid dispersion formulation using skimmed milk for improved Oral bioavailability. Acta Pharm Sin B 2012;2:421-8. Zidan AS, Rahman Z, Sayeed V, Raw A, Yu L, Khan MA. Crystallinity evaluation of tacrolimus solid dispersions by chemometric analysis. Int J Pharm 2012;423:341-50. Sonar PA, Behera AL, Banerjee SK, Gaikwad DD, Harer SL. Preparation and characterization of simvastatin solid dispersion using skimmed milk. Drug Dev Ind Pharm 2015;41:22-7. Ravouru NN, Penjuri BS, Damineni S, Muni RL, Poreddy SR. Preparation and in vitro evaluation of ibuprofen spherical agglomerates. Turk J Pharm Sci 2018;15:7-15. Ahire BR, Rane BR, Bakliwal SR, Pawar SP. Solubility enhancement of poorly water soluble drug by solid dispersion techniques. Int J Pharm Tech Res 2010;2:2007-15.